Welcome to The MuscleCar Place! 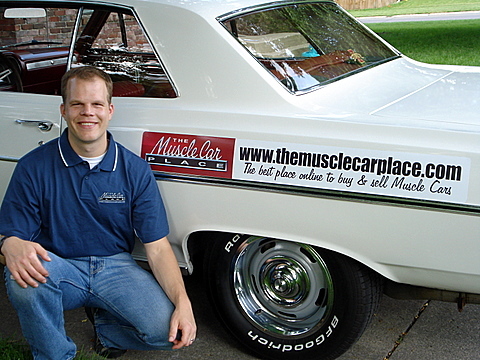 The MuscleCar Place is based in Ames, Iowa and is owned by me – Robert Kibbe. I’m a Mechanical Engineer, am in my mid 30’s, am married, and have 3 children so far – one boy and two girls. I am a certified muscle car nut, and have been from day one after I fell in love with my folks beat up and rusted out ’64 Chevelle. I grew up watching shows like The Dukes of Hazzard and the influence of that never wore off (and I have the speeding tickets to prove it). Like you, I don’t just like muscle cars….I love them. I’m bananas about them, and I know that I’m not alone. There is simply something magical about these old cars…..they’re more than just good looking sheet metal stuffed with giant motors. They’re alive. They’re cool. They’re fun. They’re manly. And, they’re our pals…..kind of like a cross between your best buddy and your dog. I have personally driven my ’64 Chevelle away from high school prom and graduation, college graduation, away from my wedding, and have brought both of my children home from the hospital in it – my old car has never let me down. It’s my goal to provide a service that allows all of us the ability to buy and sell our cars, share our car stories with our friends, and take our cars on the adventures that we’ve always dreamed of. I want The MuscleCar Place to be the best place on the web that provides muscle car nuts like us a place to live and share everything related to our hobby. Whether you’re just buying your first old hot rod, restoring one, like them stock or modified, or your car has been in your family since Day 1 – this is the place for you. I realize that there may be bigger players out there, but no one is as passionate about old muscle cars than those of us here at The MuscleCar Place. We are not a subsidiary of a larger car sales service that also sells muscle cars. We deal in muscle cars sales and the muscle car lifestyle only, plain and simple. It’s our one and only specialty! Sign up for our weekly podcast and e-newsletter – they’re both free! You can get the podcast show right here on our website, in iTunes, and also in Stitcher – just click your favorite icon below! Please also check out our Facebook and Twitter pages….because it’s all the rage. Write me with your questions or to share your story with everyone, because the more the merrier! And lastly, don’t forget to browse through the car listings….if you didn’t already! p.s. I’ll end this with a little trip down memory lane….. This is my first car - a rear-wheel drive pedal car called a 'Tuffy'. I got it for my 4th birthday. I loved it (and still have it). The wheels were plastic - and hollow. My dad started buying replacement wheels by the gross after I figured out how to do bootlegger turns. Here is a picture of what my mom called "my first love" - and she was talking about the car! This is our '64 Chevelle when it was brand new. My mom is in the picture. She had just picked it up after it had been delivered to the Chevy dealer in my parents home town of Osage City, Kansas (it was a custom order). Believe it or not, this was the condition of the Chevelle when I fell in love with it. 20 years of living in the salty Iowa winters had taken it's toll. The car had been hit in both quarters. The drivers side door had been hit and was replaced with one from a '65. There were 2x4's holding the drivers side of the front seat in. She was in rough shape! Funny enough, the radio still worked. Here is a shot of me cutting out what's left of the trunk floors. Like I said, it was bad. Really, really, really, really bad. Here is a shot of the new quarters going on. We hired a shop to do the major body work. We also ended up needing a different frame after we deemed the original too bad to use. We bought a '65 Chevelle for parts that turned out to be about 10x nicer than ours was! Oh well. It's the soul that counts, right? The Chevelle lives! This shot is just after the completion of the original restoration. We essentially left it stock except for a set of headers, rally wheels, and transmission (I swapped the Powerglide automatic for a 4-speed). Once I was in college I hopped the Chevelle up quite a bit. This is the first motor built for it - a nice streetable 350. I also put in a limited slip rear end with 3.55 gears, a full Hotchkis suspension, swapped the manual front brakes to power disc ones, changed the manual steering box over to a quick-ratio power unit, and put bigger 15x7 rally wheels and 245x60x15 BFG T/A's on it. It's hard work being a young man with a fast car. I mentioned above that I grew up watching The Dukes of Hazzard. It turns out that some of the lessons in that TV show should not be applied literally. I'm really thankful that this Iowa State Trooper chose to just give me two tickets and didn't arrest me (and I thought it was really cool that he posed for the picture). Here is a shot of my wife and I leaving our wedding....at high speed. It's really fun to do a burnout while wearing a tux. My wife waved to the crowd as we left. I have a video of it in the blog archives and on The MuscleCar Place Facebook page. I'll end with this photo. I was just taking the family out for a spin in the Chevelle after putting in a new 350 and a new 4-speed (hot rod parts never last forever). My wife is about 6 months pregnant with our 2nd child in this picture and our daughter and dog are in the back seat. We brought our son home from the hospital in the Chevelle a few months later - in the snow!